Patrick Brown is up to his old tricks again. He's been focussing on Max Payne 3 related artwork as of late, but today he's produced this fantastic piece of artwork for Grand Theft Auto, showing all the protagonists of the series. Click the image below to see it in full. We should probably point out that Albert De Silva isn't actually 100% confirmed as the protagonist of GTA V at the moment, it's simply based on some assumptions and a "leak" at this point. You can see more of Patrick's amazing artwork on his DeviantArt page. Popular GTA IV modding tool OpenIV has finally reached a 1.0 release today. The main new addition in this update by GooD-NTS and the rest of the team is support for opening and viewing Max Payne 3 textures and collision bounds objects. The video below demonstrates some of the tool's features. Download links after the video. Making the rounds in the news today and this past week have been stories regarding the supposed release date of GTA V, following the leak of a Rockstar North employee's CV. 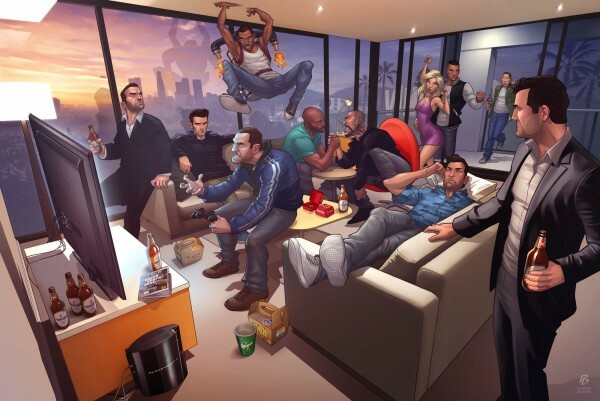 Understandably this spread like wildfire after the CV revealed GTA V's release date to be October 2012. Why is this a problem? Well, the CV isn't real. We've heard from an actual Rockstar source that it's a falsified document. And upon further investigation this appears to check out. The "leak" appears to originate from a so-called "fansite", which consists mostly of completely made up information on GTA V.
The site in question is GTA-V5.com, owned and operated by one Dan Neil. Before moving to this domain, Neil had previously written at least two articles on his blogspot site consisting of fake information and claimed it was leaked from Take-Two  and . We should point out that Neil's blogs are plastered with advertising, including promises of a free copy of GTA V, alongside other questionable affiliate based adverts from a UK company called JeebiesFreebie.com, which we would advise you all to stay away from; we don't think you'll be getting any free games. Update: Another site, GTA5videos.com, may also be responsible for some of the rumours being created. Creating a CV containing non-public information and using a real employee's name and details is a downright stupid idea. This could easily land the employee in hot water with Rockstar, who at the time of the leak, may not be aware it's not actually real. Unfortunately given the nature of this information, a number of major gaming news outlets picked it up causing it to spread even more. Rather amusingly, Neil also reported on his blog that Rockstar Games took down GTANet, the largest GTA fansite, following the leak being posted on GTAForums. It is laughable that anyone would believe this - Rockstar would never take down legitimate GTA fansites, especially not those they officially recognise and invite to events. The real reason the network was down was simply due to some issues that occurred from a server migration, nothing more, and at the time of posting this, appears to be back online. The likes of OXM and MCV and indeed a number of other reputable networks don't seem to care much for journalistic integrity these days, and it seems that sadly they'll post anything any random newly created blog gives them. So folks, if you do see some rumours being posted that are reported to have been "leaked" from a Rockstar/T2 employee, please apply some critical thinking and look at who originated the leak. Hint: If it's from some ad-filled blog, it's not going to be real. And one final note, Take-Two are at E3 mainly for the new Borderlands game, not GTA V.